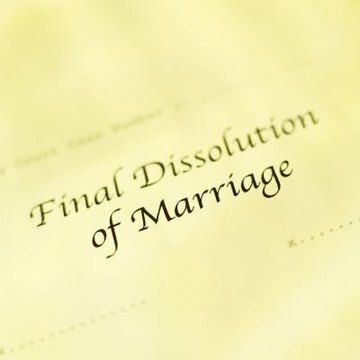 If you are going through a divorce, you will encounter many different documents pertaining to the divorce. As the divorce proceeds, the lawyers handling the case create a settlement statement. They present it to the judge, and after the judge rules and finalizes the divorce, the settlement statement becomes part of the final divorce decree. When a divorce is complete, a judge orders that the marriage is terminated, and the two parties involved receive a final divorce decree. This document states the rights and responsibilities of both parties and includes basic information. It also includes a copy of the settlement statement. What Is the Difference Between a Divorce Decree & Divorce Certificate? A settlement statement, also called a marital settlement agreement, is a document that lists the division of a couple's assets and liabilities. It is an agreement both parties make to each other. It lists each person's name along with the assets each will receive and the debts each are responsible for. Many times, a couple getting divorced will receive a copy of this statement prior to their final divorce court hearing. This allows each person time to look it over to ensure that it is accurate. A final divorce decree is the actual document that the court issues stating that you are divorced. It must contain the names of both parties, case number, date of divorce and all of the terms of the divorce. If the final divorce decree does not have a copy of the settlement statement attached, it will contain the same information directly in the decree. A final divorce decree also states other issues such as child custody, child support, alimony and any other necessary details. If you are divorced and must prove your marital status, a copy of the divorce decree will work. It is a court-issued document and is on official public record in the courthouse in which it took place. A settlement statement, on the other hand, is not proof that the divorce is finalized. VanBaren, Jennifer. "Difference Between a Final Divorce Decree and a Settlement Agreement." , https://legalbeagle.com/8742791-difference-divorce-decree-settlement-agreement.html. Accessed 24 April 2019.